Bella Vella (2yo f Commands x Forget The Weather) (pictured) broke her maiden at Pakenham after showing plenty of promise when registering a 2nd and a 3rd at her two previous starts. 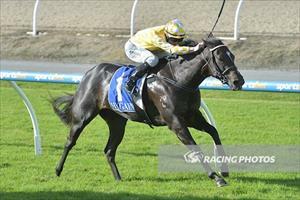 “She is a strong, fast sprinting filly who handles the heavy ground very well” said trainer Mike Moroney. Bella Vella was a Paul Moroney Bloodstock selection from the 2016 Magic Millions Sale for Sir Owen Glenn and the filly is raced by his granddaughters Maddy and Penny Connah. This win has certainly provided them with a thrilling start to racing. Congratulations to all winning connections Sir Owen Glenn and Maddy and Penny Connah.